At any rate, everyone LOVED this cake at Max's birthday celebration, and I didn't even have to turn on the oven or crack an egg. Good stuff, indeed. Unwrap four ice cream sandwiches and place them snugly side-by-side on a serving plate that is large enough to hold the cake. 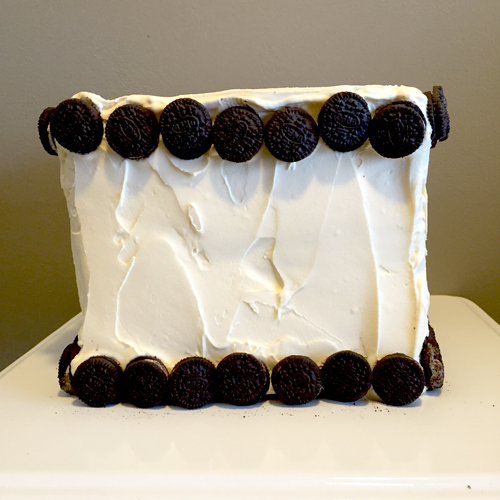 On a cutting board, disassemble the cookies & cream ice cream box so that it's exposed on all four sides and the top. Cut off about 1/3 of the rectangular prism, lengthwise, and place resulting rectangle onto the side-by-side ice cream sandwiches on the plate. 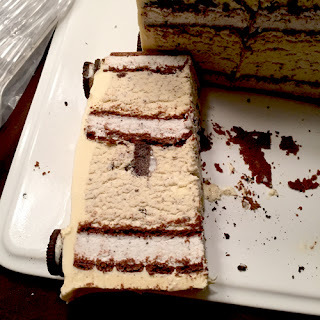 Add another layer of unwrapped sandwiches on top of the cookies & cream layer. Cut another 1/3 of the cookies and cream and place on top of the second layer of sandwiches. 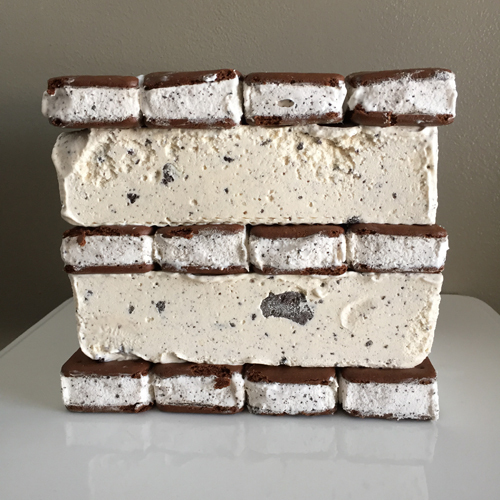 Top with the final four ice cream sandwiches. Cover with plastic wrap and place in the freezer until ice cream is hard. Be sure to wrap of up and freeze remaining 1/3 of the cookies & cream ice cream. Eat it later when the cake is gone. During the last 15 minutes or so of the cake freezing, remove the vanilla ice cream from the freezer and let it sit at room temperature (for about 15 minutes). When ice cream is soft enough to scoop easily, but not at all melted, scoop about 1/4 gallon (half of a half gallon) into a bowl (preferably a standing mixer bowl). Stir with a spoon or paddle attachment on your mixer, until ice cream is smooth. Get the cake out of the freezer and quickly frost the cake with the vanilla ice cream. Then decorate the edges with the mini Oreos. Cover cake with plastic wrap and place in the freezer for at least two hours before serving. Cut along the long side and then cut each of those large slices into three slices.